We started out 2012 with Madison's first birthday, and I (Karla) went back to work in early January. February and March were filled with anxiety as Liam's vomiting was becoming more frequent, but we were unable to get any answers. Many phone calls, appointments and various scans, our doctor was getting Liam as many tests as we could, but the referral to a gastrointestinal specialist had a 2 month wait. 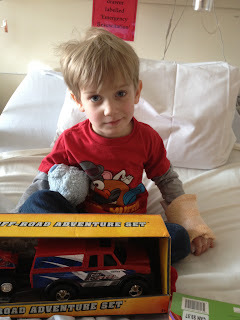 We finally just took Liam to the Alberta Children's Hospital here in Calgary on April 30. The triage nurse at the Children's Hospital immediately sent Liam for CT scans and was asking neurological related questions, it was like she knew right away. This is where life took a turn, and will be the day we will never forget. "Your son has a brain tumour". This picture was taken the morning before Liam went to the hospital, our last moments of blissful ignorance. Liam got admitted and stayed in the hospital the night before surgery. He didn't understand what it meant for him to go into surgery the next day, but he knew things were not right. For us, on the other hand, torture not knowing what would happen to our beautiful little boy after the surgery. Multiple surgeries, many MRIs and scans, 6 months of chemotherapy, 3 stem cell transplants, he stayed a total of 86 nights in the hospital, and now we are in the middle of 6 weeks of daily radiation. The amazing thing about kids this age is they don't ask "why me", they don't feel self pity. Liam just keeps on playing and playing. Liam was able to enjoy Christmas to the fullest. Liam was able to attend Jamie's preschool for November/December, and will continue in the new year, he absolutely loves it. Who would have thought through all Liam has gone through, he would have the balance and coordination to even be able to skate. Liam's first time out skating this winter, a week ago, he was really scared of falling, but he had no problem walking with the skates off the ice, and was able to balance on the ice. 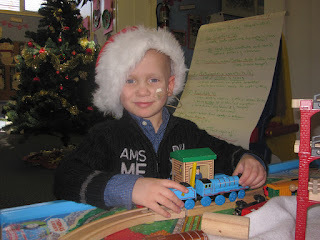 Liam has some challenges, he'll continue with physio/occupational/speech therapy. We also need to figure out how to get Liam to eat after treatment is done, so he can gain some weight. But, otherwise, we are so, so thankful and fortunate for how well Liam has done throughout all he has gone through.